368 The Longman Academic Writing Series helps students master the academic writing skills needed to succeed in their academic careers. 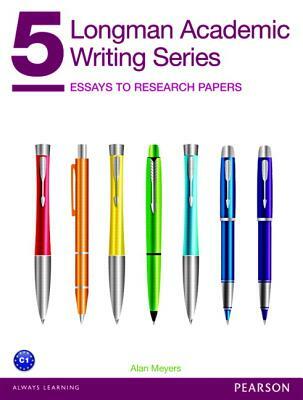 The five-level series spans writing topics from composing sentences to writing research papers. Each level covers the complete writing process from prewriting to revision. Level 5 teaches advanced students to write various genres of academic essays and research papers. The text's writing process approach integrates training in grammar, vocabulary, sentence structure, and research techniques along with essay and research paper organization. Features * Realistic writing models from various rhetorical genres explore academic disciplines such as biology, sociology, and history. * Vocabulary sections expand students' language awareness and improve the quality of their writing. * Sentence structure and grammar review helps students improve writing skills. * Preparation for Writing sections provide guidance and practice in researching, evaluating, and documenting sources. * A step-by-step approach guides students seamlessly through the writing process. * Writing Tips provide useful strategies to enhance students' writing experience.